Parcel Number: Also known as PIN (Property Index Number). This unique number identifies your property. 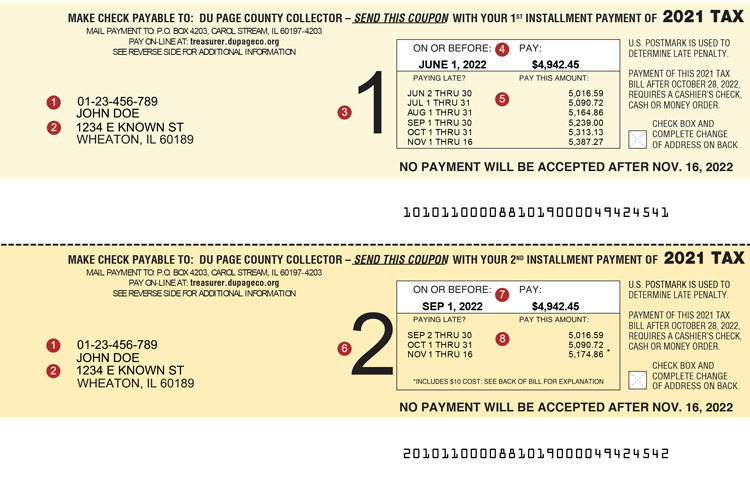 Billing Name and Address: To change Billing Name or Address contact the County Clerk at 630-407-5540. 1st installment payment coupon: Payment due on or before June 3, 2019. One tax bill is sent per year with two coupons attached for your 1st and 2nd real estate installment payments. Total Amount Due: Payment due on or before June 3, 2019. Pay this amount if paying after the due date: U.S. Postmark is used to determine late payment penalty. 2nd installment payment coupon: Payment due on or before September 3, 2019. One tax bill is sent per year with two coupons attached for your 1st and 2nd real estate installment payments. Total Amount Due: Payment due on or before September 3, 2019. Rate 2016: 2016 tax rates shown for comparison. Taxing District: Listing of all taxing districts that receive your tax dollars, sorted by County, Local, Education and TIF District. 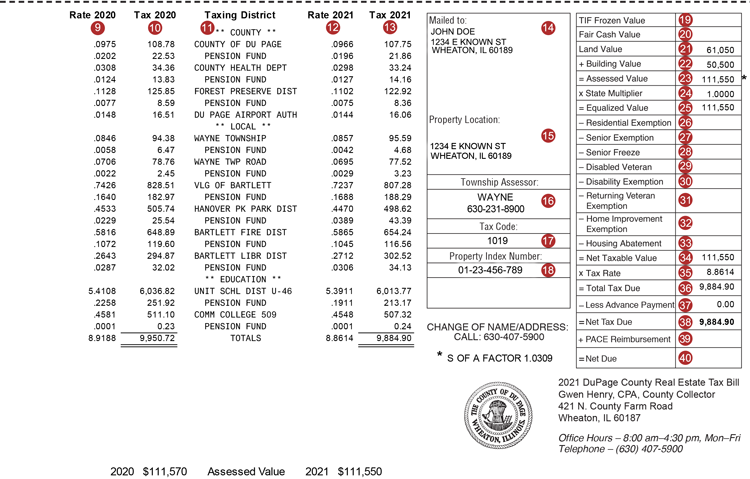 Rate 2017: 2017 tax rate is determined by the combined spending of all taxing districts, including the County, the Forest Preserve District, townships, community colleges, schools, villages, fire districts, libraries, parks, etc. Each taxing district prepares a budget, requests the revenues needed, and submits the request to the County Clerk. The County Clerk calculates the tax rate based on their requests. Tax 2017: The amount of tax for 2017. Mailed to: Billing name and address. To change billing name or address contact the County Clerk at 630-407-5540. Property Location: Property address if available. Township Assessor: Township is the area in which the property is located. Assessment questions should be directed to your Township Assessor. Tax Code: Tax code identifies the taxing districts that receive your tax dollars. Property Index Number: Parcel Number also known as PIN (Property Index Number). This unique number identifies your property. TIF Frozen Value: The frozen value that determines how much tax will be distributed to the TIF district. Fair Cash Value: The value the assessor places on each residential parcel of real estate. Land Value: The assessed valuation of the land only. Building Value: The assessed valuation of the building only. Assessed Value: The total value for land and building. State Multiplier: Multiplier which equalizes assessed value. If assessed values are too low or too high, the State will apply a multiplier to all assessments to equalize the assessments to one-third of the fair market value. This value is known as the Equalized Value. Equalized Value: One-third of the fair cash value of your property. The assessor is required by law to assess properties at one-third of their market value. Residential Exemption: Lowers the taxable value of the property up to $6,000. To qualify for this exemption, a homeowner must live in the home on or before January 1st of the tax year. Senior Exemption: Lowers the taxable value of the property up to $5,000. To qualify for this exemption, a homeowner must have lived in the home and reached 65 years of age during the tax year. Senior Freeze: Freezes the assessed value on your property. To qualify for this exemption, a homeowner must apply and establish age, ownership, residency and have a total household income of $55,000 or less. Disabled Veteran: Returning Veteran Exemption provides an annual reduction in the assessed value of the primary residence occupied by a disabled veteran each year depending on the percentage of the veteran's service connected disability. Disability Exemption: Provides an annual $2,000 reduction in the assessed value of the property owned and occupied on January 1 of the assessment year by the disabled person who is liable for the payment of the property taxes. Returning Veteran Exemption: Provides a one-time $5,000 reduction in the assessed value of the veteran's primary residence for the taxable year that the veteran returns from active duty in an armed conflict involving the armed forces of the United States. Home Improvement Exemption: Homestead Improvement Exemption provides an exemption of up to $25,000 of assessment increase due to home improvement. Housing Abatement: Provides a reduction in value for qualified units of section 8 housing. Net Taxable Value: The equalized value minus any exemptions. Tax Rate: The sum of the rates in the "Rate 2017" column. Total Tax Due: Total current tax due. Less Advance Payment: Prepaid tax payments. Net Tax Due: Net tax due.